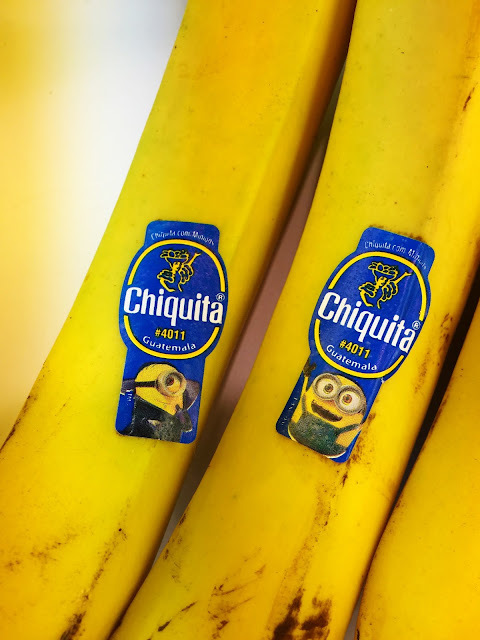 Bananas are a favorite food of the movie franchise characters "the Minions." The marketing mavens of "The Minions" found me in my hazy morning funk when I picked up a banana. I suppose I should be happy there is a movie tie-in on a healthful piece of fruit. I wasn't inclined to see this movie, even though I enthusiastically take my kids to animated films, until I learned that a pressing journalistic question was "Are the Minions Latino?" The NPR show Latino USA took on this question for a delightful piece that explained why there is so much Spanish in the invented language of the Minions and why the characters resonates so strongly with Latino audiences. To the first question, the co-director Pierre Coffin took a bunch of take-out menus home and from the word list expressively used food items for the Minion language; Coffin finding Spanish a lyrical popular language. The answer why Minions resonate with Latinos was more elusive. In general, movie-going stats support a huge demographic of Latinas seeing a large number of movies. In the NPR piece, Latino USA producer Antonia Cereijido posits semi-seriously that Minions come to the USA by boat, speak a different language, and want to work in people's homes. I realize sometimes cultural phenomena should just be enjoyed rather than analyzed. One detail from the Latino USA piece that I particularly enjoyed was that in a rural area of Guatemala, where few popular-culture items are found, Minion scarves, coin purses and jewelry were available. The bananas I purchased come from Guatemala, coincidence?